Tammy Duckworth is one of today’s most remarkable American women. I posted a blog in 2014 about Senator Duckworth – whose first name is Ladda – when she was U.S. Representative of the 8th District in Illinois, but in 2016 she was elected junior senator from Illinois and in April 2018 at the age of 50 gave birth to daughter Maile. She and husband Bryan Bowlsbey also have daughter Abigail, born in November 2014. 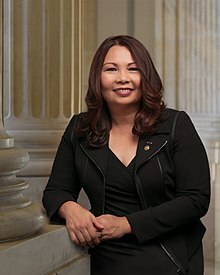 Senator Duckworth was born in 1986 in Bangkok, Thailand of Thai mother Lamai Sompornpairin and Franklin Duckworth, an Army veteran. The Duckworths settled in Hawaii where Tammy received her degree in political science from University of Hawaii. She received a master’s degree from George Washington University in international affairs, then moved to Illinois to study for a Ph.D. in political science at Northern Illinois University in DeKalb. While there, she enrolled in the Reserve Officers’ Training Corps with the Illinois Army National Guard and trained to be a helicopter pilot. She suspended her studies when she was deployed to Iraq. On Nov. 12, 2004, the Black Hawk helicopter she was co-piloting was shot down. She lost her entire right leg, her left leg below the knee and lost significant use of her right arm. She was 36 years old and had married Bryan, fellow Illinois Army National Guard member, in 1993. Bryan is the joint regional security stacks migration manager at VAE, Inc. in Virginia. It took Duckworth a year to recover from her injuries, and she chose to advocate for better health care for wounded veterans. She ran in her first Congressional race in 2006, lost that election but accepted the post of Director of the Illinois Department of Veterans Affairs. She started a program helping those with post-traumatic stress disorder and brain injuries. In 2009 President Obama chose her to be assistant secretary for public and intergovernmental affairs in the U.S. Department of Veterans Affairs. She concentrated her efforts on ending homelessness for veterans. In 2012 she won election to the House of Representatives and won reelection in 2014. She was pregnant and due to deliver baby girl, Abigail, within weeks but her doctor did not recommend she travel to Washington for House Democratic Caucus leadership meetings. She requested to vote by proxy, but rules do not allow proxy votes, so her request was denied. Members of the Caucus objected, but Minority Leader Nancy Pelosi voted with the majority that no exceptions be made, no matter the circumstances. in 2015 she received a Ph.D. in human services from Capella University. After she gave birth to Maile, rules were changed so that a senator has the right to bring a child under one year old on the Senate floor and breastfeed during votes. The day after those rules changed, Duckworth brought Maile on the Senate floor.